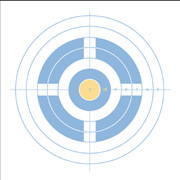 Click image to display full-size target. Click here to download both .pdf targets as a .ZIP archive. The left target is very good for shooting small groups; the diamonds have 1/2" sides and you can align your cross-hairs on the horizontal and vertical lines. It is a clean design that is easy to see even at 200 yards with a 20x scope. You can also use the top circles as a 200yard zero when aiming at the red squares at 100 yards. All your load data fits neatly in the boxes under each target. Note, the left target is also available as a "Powerpoint" file you can display and edit with MS Office. Click here to download left target Powerpoint file (this also has two bonus 25m pistol targets). The right target has boxes for load data on the left, and larger 1" red circles in a 1" grid. Click image to view full-size target. Click here to download all three .pdf targets as a .ZIP archive. James Phillips created the first two targets for the Varmint Den Message Board. Trust us, these targets will really help shrink your groups. (James recently broke the existing IBS 600-yd world record, with a 1.174" 5-shot group.) They work best with a high-magnification scope with fine cross-hairs. The left target can also be used to enter velocity data when using a chrono. We often use this at 50 yards when load testing. The center target has 1/2" circles which make the target easier to see at 100 yards. Fine grid lines above the center dot allow you to quickly estimate your group size. The right target is a conventional bullseye with a 1" X-ring for 100-yard shooting. 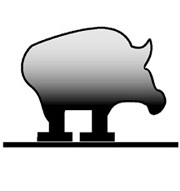 You can also download the NRA MR-31c target below, which is a 600-yard bull scaled for 100 yards. It has a slightly smaller X-ring. Click here to download all three targets as a .ZIP archive. These are all good targets for 200-300 yards, each filling up an 8.5x11" sheet of paper. Even with a 16x scope you can center your reticle on the target easily at 200 yards. The center diamond target also works well with Red Dot and iron sights at 50 yards. If you set your printer to Black and White, the colors will print dark gray. These targets are MS Word or Acrobat .pdf files so the grid lines print accurately. 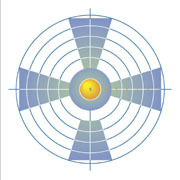 Many more good medium-range targets, created by Grant Ubl, are available at the U.S. Palma Team Website. These are all .pdf format, so they print accurately. Click here to download all six .pdf varmint targets as a .ZIP archive. Click here to view more targets from the Varmint's Den. Turkey by DesertFrog. 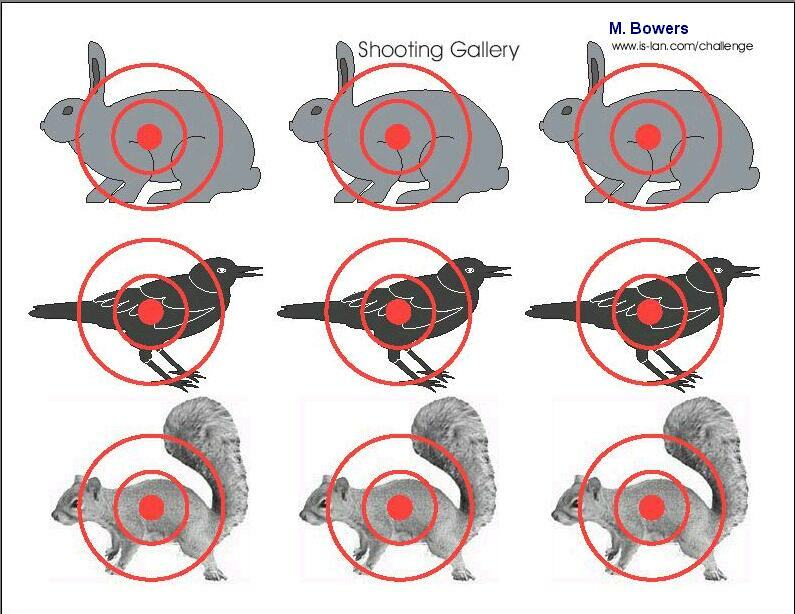 Six Varmint Shooting Gallery by Matt Bowers. Groundhogs by Mike Westerlund. Raccoon by AirHog. Grid target by Exploding Groundhog Productions. Click on image to download .pdf file. Click here to save all three targets as .pdf in .ZIP archive. These targets are all suitable for doing ladder tests or shooting multiple groups with different neck tensions or seating depths. The first target is Jason's favorite for 3-shot ladders. The center target was developed by Ted Conway and provides precise aiming points and high contrast for bullet holes. The last target features very precise target dots, with fine-line grids inside boxes. This is also excellent for rimfire practice at 25 and 50 yards. Click image to view full-size, printable target. Click here to save all three targets as .pdf in .ZIP archive. All these targets will print better if you download them as .pdf files before printing. The first target is ideal for zeroing your scope at 100 yards, and then doing a "box" test to check the tracking. The grid can also be useful for practicing "Kentucky Windage" at longer distances. The second target is a version of the benchmark USAF 1951 optical resolution chart. The better your scope the finer the lines it will resolve. The third target is another resolution checker--use this to see how well your scope resolves fine lines. The Atomic Target was originally created as a contest for our readers. The design is by Michael Forester of Auckland, New Zealand. Hit the bigger green and red neutrons, then try your luck with the smaller electrons. In the center, go for true "bug-holes" with our Fly Shoot Target. Watch out for the bio-hazard rings! On the right is a checkerboard target. To save printer ink, set your printer for "economy" before printing. Click on image to download .pdf file. Click here to download all three targets as .pdf in .ZIP archive. Silhouette Targets courtesy Thomas Haller. His website also features superb colorized bullseye targets, shown next. These 3D targets by Thomas Haller use a "faded" color setting to reduce ink consumption when using an ink-jet, but they are still quite visible on the range. You can print in Grayscale or use a copying machine if you want to print them in black and white. Click on image to download .pdf file. Click here to download all three 3D Bullseye targets as a .ZIP archive. Click here to download all three .pdf NRA bullseye targets as a .ZIP archive. 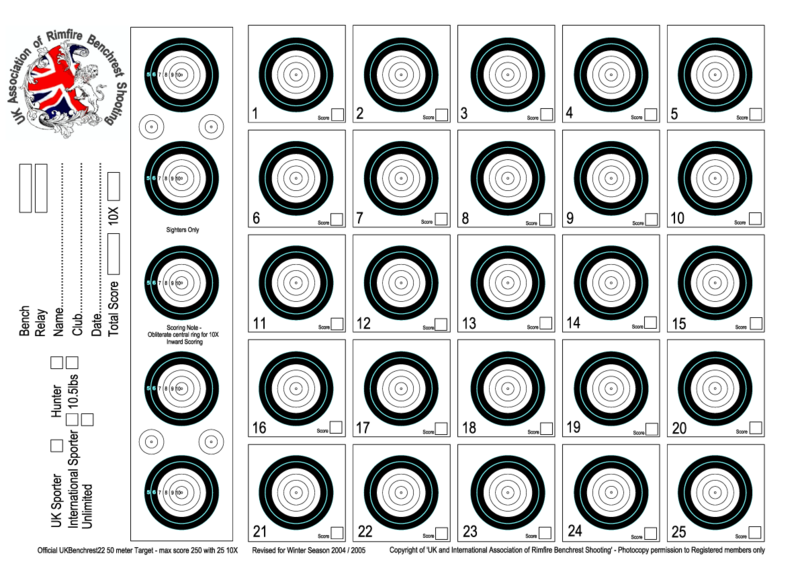 Being .pdf files, these clone targets print out to within 1/16" of the NRA originals. Plenty good for practice. It is best to print one or two copies of these targets, then photo-copy them to save on expensive printer cartridges. NRA-clone bullseye targets courtesy Ty Hoeffer. The UK Assoc. 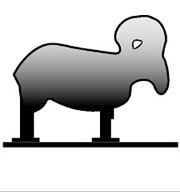 of Rimfire Benchrest Shooting has been kind enough to make these targets available. 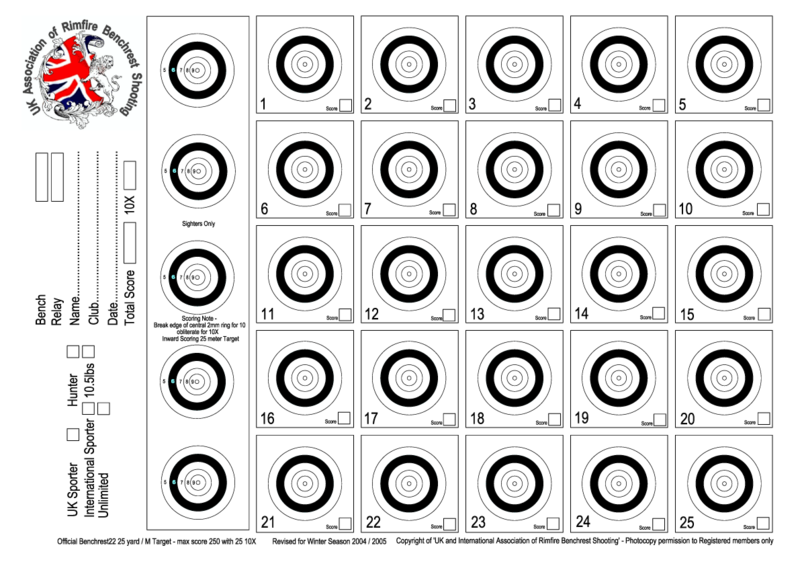 Click on image to download each UK 22 Benchrest target as a .png file. NOTE: For .png files, un-check the 'Shrink Oversized Pages To Paper Size' box on the print popup for the targets to print to the correct scale. You will also need to use over-sized paper for 100% output. Scoring: Cut central ring for 10, obliterate for 10 X. If you want to make your own custom targets, Ammoman.com sells Targetmaster design software for just $8.00. These FREE targets by DesertFrog are offered in Adobe Acrobat format for easy printing. 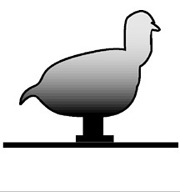 These are the type of targets use in Rimfire Tactical matches at distances from 25 to 200 yards. All these targets are in Adobe .pdf format for easy printing at the proper size.These targets were created by DesertFrog. They are copyright ? 2008, Bauder Studio, All Rights Reserved. They are free for personal, non-commercial use. These targets come from the Czech Republic where they are used in "Smallbore Sniper Rifle" competitions. Most of the targets are used "on the clock" with time limits. The "Alpha, Bravo etc." bullseyes are shot on command with 3 seconds to hit the target named by the Rangemaster. The "36 Smileys" target requires the shooter to hit 10 specific targets among a field of similar faces. CLICK HERE to download ALL targets as a 1 megabyte .ZIP archive. Targets are .pdf files.